In Germany, scientific criteria documents for the level of national workplace limit values and the body of data according to which hazardous substances are classified are not collected and published centrally. Instead, the relevant texts are to be found in a variety of loose-leaf collections, series of publications, or on the Internet. The GESTIS database of scientific criteria documents provides bibliographical information and links to the sources explaining the reasoning for the derivation of substance-specific atmospheric limit values and the classification of working agents as "carcinogenic", "mutagenic", "reprotoxic" or "sensitising". 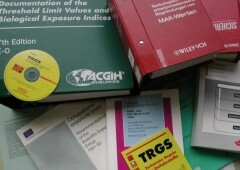 The database is not limited to substances which are currently classified in the Federal Republic of Germany or for which a workplace limit value currently exists; it extends to all substances the atmospheric limit values of which have been removed from the body of German regulations since 2005 in the wake of revision of the regulation governing hazardous substances. The reasons for abolition of the atmospheric limit values concerned are stated. The GESTIS database of scientific criteria documents is produced and maintained by the Institut für Arbeitsschutz der Deutschen Gesetzlichen Unfallversicherung (IFA, Institute for Occupational Safety and Health of the German Social Accident Insurance). You are welcome to contact us by e-mail with your suggestions and constructive criticism. The authors are grateful to the publishers Urban & Fischer for their kind consent. The database may be used for occupational safety and health purposes and for obtaining information on the risks presented by chemical substances. Commercial use of the data and their inclusion in full or in part in other information systems is not permitted. The information contained in the GESTIS database of scientific criteria documents is produced and updated with care. No liability may however be accepted, on whatever legal basis. No responsibility can be assumed for the content of web pages to which links are provided.